To inquire about pricing or to purchase an original painting please email us for availability of that work through the "Contact" page. 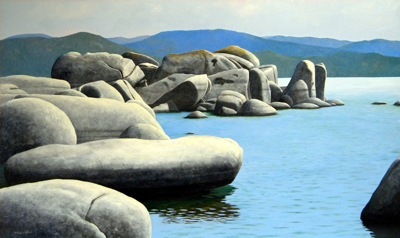 We will tell you what Fine Art Gallery is currently exhibiting the work you are interested in. ALL CONTENT © 2007 Frank Wilson. 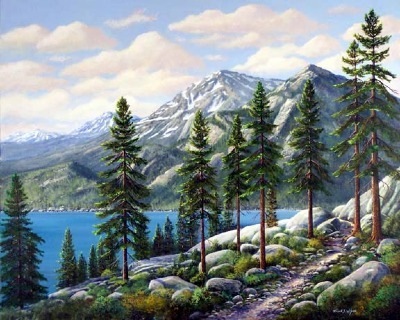 "Rocky Cove ~ Lake Tahoe"
an original oil painting on hardboard 36" x 60"
This painting was a special commission and is one of my "landscape portraits" of an actual place on the North shore of Lake Tahoe on the Nevada side. Every detail of this spectacular rocky cove has been recorded in this oil painting. Some of these rocks stand 30 feet out of the water! Fine art prints in sizes up to 24 x 44 inches are available on fine art papers and a variety of custom canvas options. 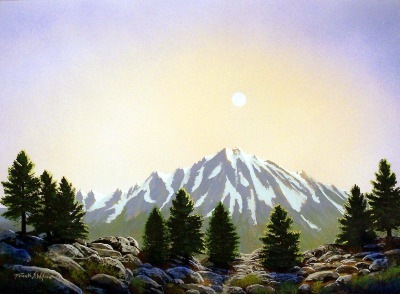 You may also order 5 x 7 inch customizable greeting cards of this painting. Click Here to see your options. 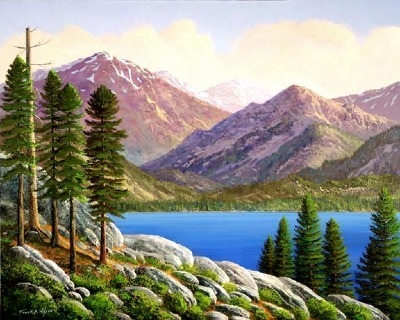 is an original oil painting on hardboard 24" x 36". Prints are available in several sizes on paper or canvas. 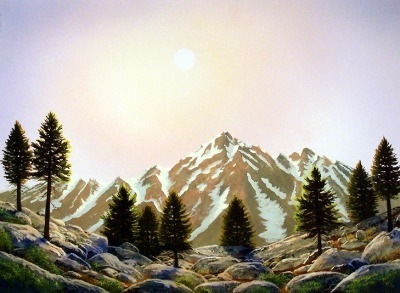 You may also order 5 x 7 inch customizable greeting cards of this painting. Click here. 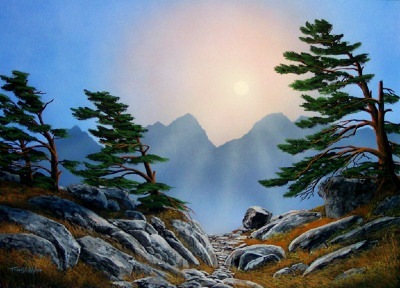 is an original oil painting on hardboard 16" x 20". is an original oil on hardboard 24" x 30". Prints available on canvas or paper in several sizes. You may also order 5 x 7 inch customizable greeting cards of this painting. Click here. 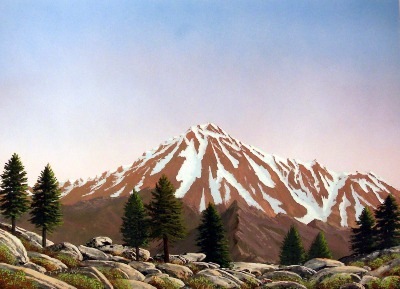 is an original oil on hardboard 24" x 48". 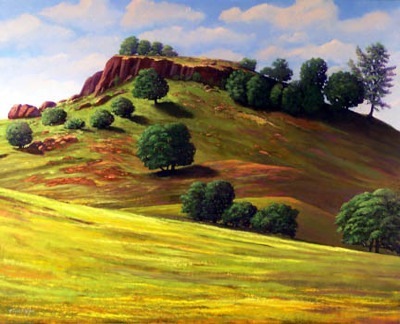 "SPRING MEADOW - MOUNT BROKEOFF"
an original oil on hardboard 12" x 24". is an original watercolor / gouache painting on 4 ply Rising Museum Board 18" x 32". "SPRING BLOOM AT TABLE MOUNTAIN"
is an original watercolor / gouache painting on 4 ply Rising Museum Board 18" x 32". The original painting has sold. Prints are available in several sizes on paper or canvas. 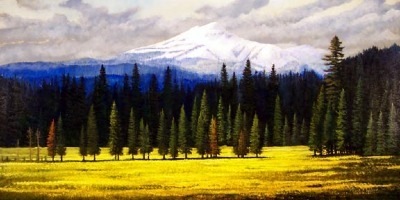 You may also order 5 x 7 inch customizable greeting cards of this painting. Click here. is an original watercolor / gouache painting on 4 ply Rising Museum Board 32" x 18". Prints are available in several sizes on paper or canvas.You may also order 5 x 7 inch customizable greeting cards of this painting. Click here. is an original watercolor / gouache painting on 4 ply Rising Museum Board 32" x 18"
is an original watercolor / gouache painting on 4 ply Rising Museum Board 22" x 28". Prints are available in several sizes on paper or canvas. 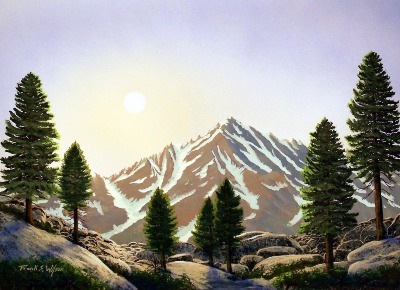 You may also order 5 x 7 inch customizable greeting cards of this painting. 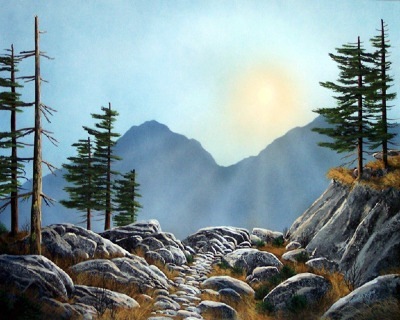 This painting was awarded an Honorable Mention Winner in the International Turner Color Works Painting Contest. Only art that was painted with Turner Designer gouache or Turner Acryl Gouache was eligible. 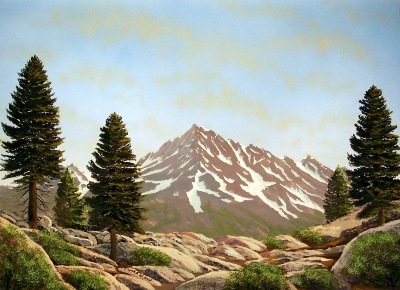 The following series of watercolor and gouache paintings are of some spectacular peaks in the High Sierra Nevada Mountains. I enjoy the rugged landscapes from high up where the air is thin and cold and summers are very short. is an original watercolor and gouache painting 12" x 16" matted size. 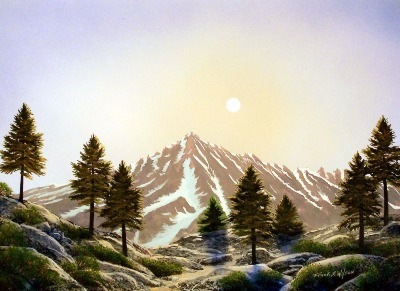 Image size; 6 3/8" x 10 1/4"
is an original watercolor and gouache painting Image size; 10 1/4" x 14 1/4" Matted size 16" x 20"
is an original watercolor and gouache painting. 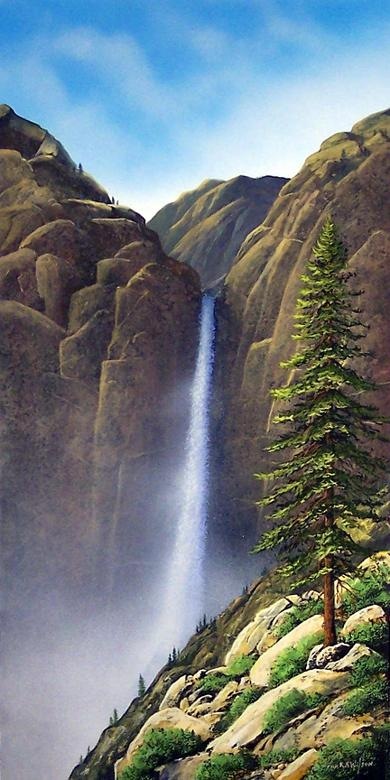 Image size; 6 3/8" x 10 1/4" Matted size; 12" x 16"